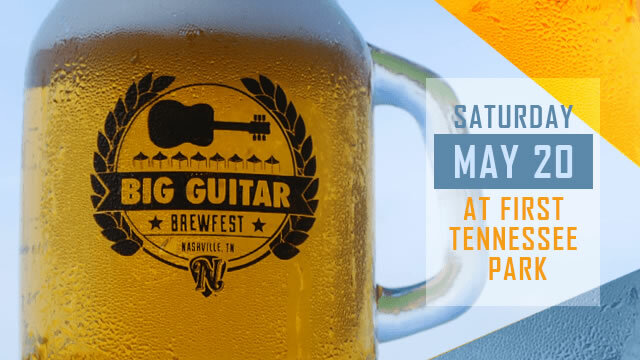 The Nashville Sounds Baseball Club will host the "Big Guitar Brewfest" at First Tennessee Park for the second consecutive year, the team announced today. From 5:00-8:00 p.m. on Saturday, May 20th, over 50 local and craft breweries will be on hand for beer connoisseurs. Tickets to the event cost $35 for general admission and $50 for VIP. Early bird pricing ($10 off all tickets) is available to the public Monday, March 20th through Thursday, April 20th. Tickets are available at the Sounds' ticket office and online here. VIP Ticket ($50): VIP includes early admission at 4:00 p.m. with free food at the first base concession area and specialty beer tasting offered from 4:00-5:00 p.m. only. VIP ticket holders will enjoy unlimited beer, liquor samples, a souvenir mini-mason jar for samples and access to the game area in The Band Box during the entire event. General Admission Ticket ($35): General Admission includes unlimited beer, liquor samples, a souvenir mini-mason jar for samples and access to the game area in The Band Box from 5:00-8:00 p.m.
Food will be for sale at the first base concession areas throughout the event. Volunteers are needed for the "Big Guitar Brewfest" and will be accepted by Centerplate General Manager Dave Keitel. If interested, please call (615) 515-1140 or e-mail david.keitel@centerplate.com. The 2017 season will be the Sounds' 40th in franchise history and their third as the Oakland Athletics' top affiliate. Opening Day is scheduled for Tuesday, April 11 as the Sounds host the Oklahoma City Dodgers at 6:35 p.m. at First Tennessee Park. Season ticket memberships are available now by calling (615) 690-4487 or by visiting www.nashvillesounds.com.